Faculty members from the departments of Nursing and Nurse Anesthesia in the College of Arts & Sciences attended the March of Dimes Missouri Chapter’s Nurse of the Year gala on Oct. 10, in support of six Webster faculty, students, and alumna nominated for this year’s Nurse of the Year Awards. 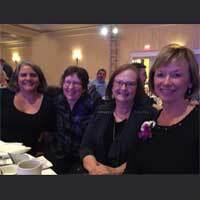 Webster alumna Barbara Sicking won the 2015 Nurse of the Year Award in the Pediatrics category. Sicking graduated with a Bachelor of Science in Nursing (BSN) degree from Webster in 2009. Read the full story at the College of Arts & Sciences blog, Global Thinking.